UP was a late entrant in converting trains to domes, except for the purchase of GM's "Train of Tomorrow" in 1950 for NP-GN-UP "pool" service. In late 1952, they placed an order for 15 cars with American Car & Foundry which grew to 35 cars by the time delivery took place between late 1954 and May 1955. 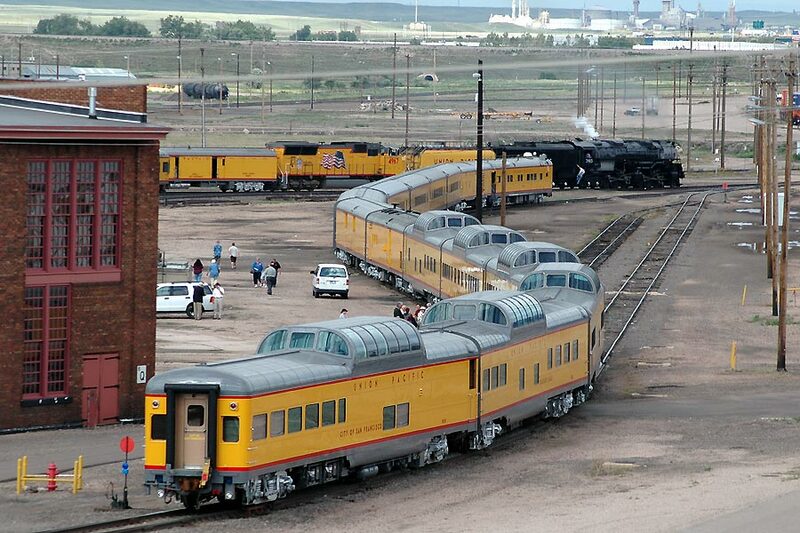 UP (5 cars) along with "City of St. Louis" partner Wabash (1 car) took delivery of the last new domes ever built from Pullman Standard in November / December 1958. 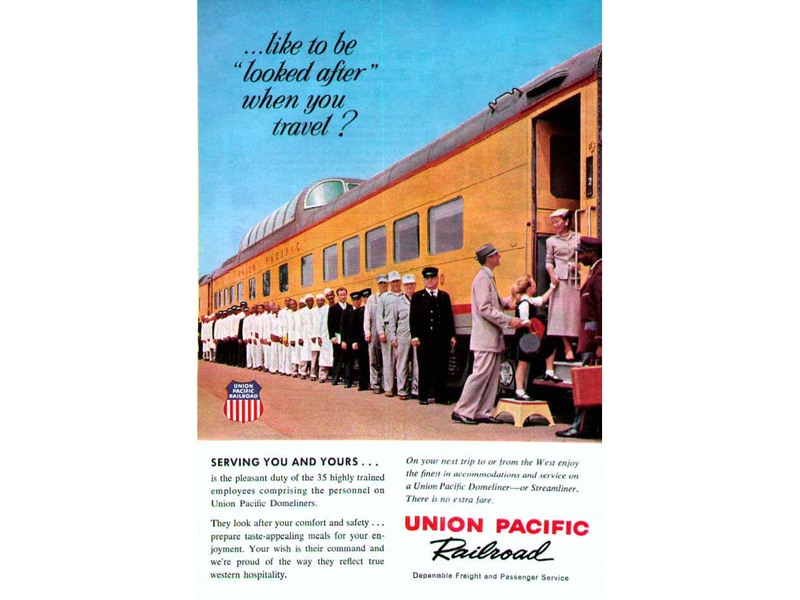 Although none of the cars ever "officially" moved to Amtrak, they actually ran in the first month or so of Amtrak's existence under short term lease on Amtrak trains operated by UP until other cars were substituted. 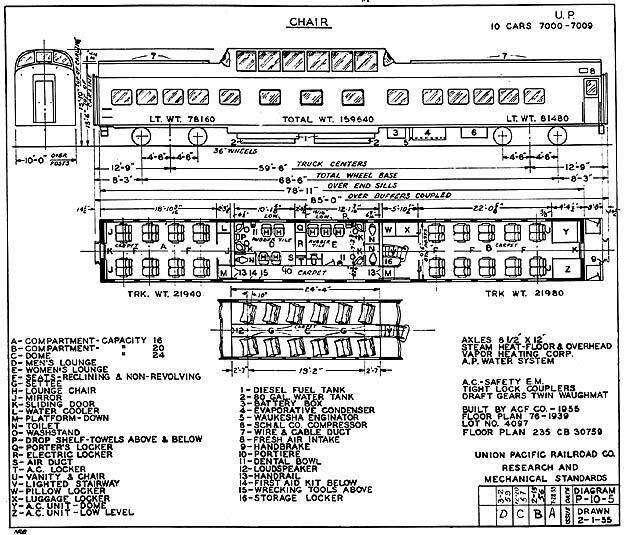 Upon "retirement", the 40 car group (excluding the GM cars and the Wabash pool car) were disbursed as follows: 4 to ARR, 33 to Auto Train, and 3 retained by UP. 1 car was later sent to Mexico and 1 to a museum, leaving UP with only one original car. 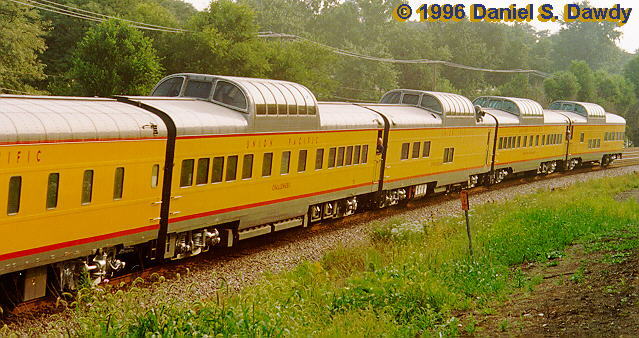 They have since repurchased 7 of the Auto Train cars from various owners, and now have a fleet of 3 obs, 3 diners, and 2 coaches (one of the coaches was rebuilt into a diner).
. 9009 "City of San Francisco"
. 8008 "City of Portland"
Interestingly, through the "maze" of car ownership over the years, UP may have ended up with the original UP 7012 back in their fleet as the "Missouri River Eagle" and INCORRECTLY numbered 7011! For the details of how and why, read car number confusion. 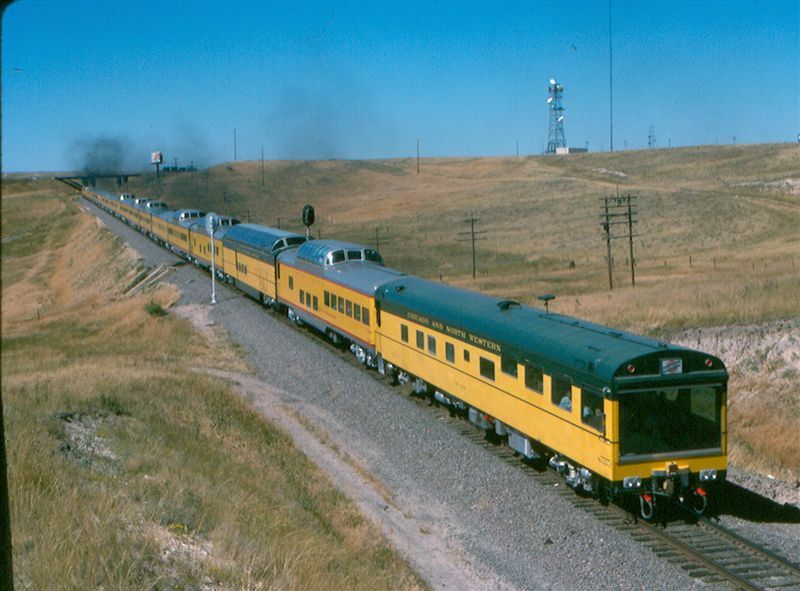 ALSO OF NOTE: When UP took over the Chicago & North Western, they "inherited"(9/11/96) business car #421 "Powder River", ex MILW 53, a 'Super Dome' (running in the special shown above). The car was stored unused except for OLS and specials and later sold to the North Carolina Dept of Transportation, but UP nonetheless qualifies as an owner of a "full" dome. 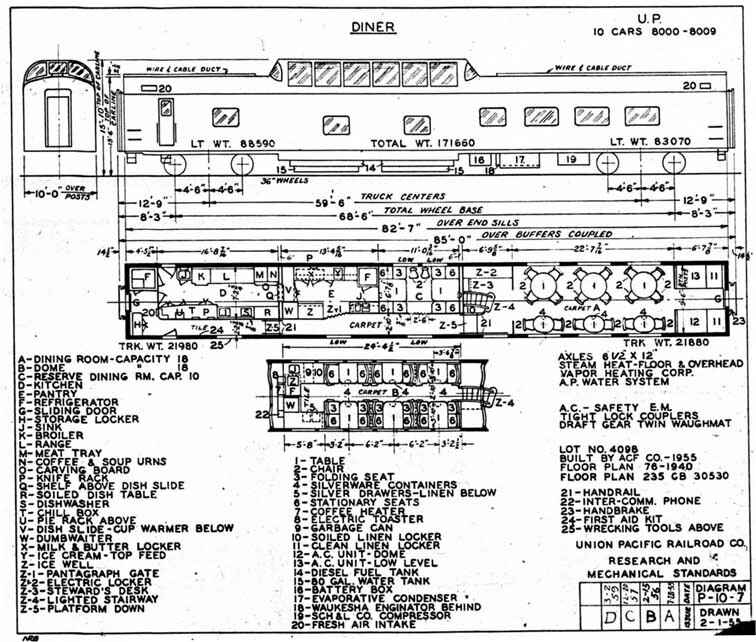 All cars were built by American Car & Foundry except the last 6 built (203/7011-7015) and the "Train of Tomorrow" cars (7010, 8010, 9015, "Dream Cloud"), all of which were built by Pullman Standard. UP 7000 - ["Challenger"-12/54], Auto Train 700 (6/72), Jonathan Gallucki Atlanta GA (12/81), Ken Bitten (1999), Henry Hillman/Oregon Rail Corp/American Orient Express/Montana Rockies Rail Tours (8/99) - car stored. During 2001, car was removed from trucks and primered and worked on. Speculation as of 4/2001 was that it might become one of the cars used on AOE in 2002 (it was not) - moved to Chehalis WA 9/2001. Possibly for sale. UP 7001 - ["Challenger"-12/54], Auto Train 701 (6/72), A J Daniels Tulsa OK (12/81), Mid-America Car Co (1982), KCS 21 (for an aborted "Southern Belle" revival), Northern Railcar, UPP 7001 (10//90) "Columbine". UP 7002 - ["Challenger"-12/54], Auto Train 702 (6/72), Keene Carpet Honaker VA (12/81), various private owners, Virginia Rail Investment Corp VRIX 200 "Roanoke" (1987), St Louis Car Co SLCC 200 (10/89), Rail Cruise America (800200) "Mark Twain Lake", renamed "Mississippi River" (1999). Sold 12/05 to Kansas City Southern and renamed "Kansas City" for use on 'Southern Belle' business train. UP 7004 - ["Challenger"-12/54], Alaska RR 7004 (5/72) wrecked 7/6/75 at Hurricane AK when the "Au-Ro-Ra" was rearended by a freight train. UP 7005 - ["City of Portland"-12/54], Auto Train 704 (6/72). Buyer defaulted at Auto Train auction and later sold to Passenger Car Associates. Car was missing one truck (had been stored separately and was sold to a scrapper who cut it up). Car salvaged for all usable parts and scrapped at Sanford FL by DJJ of Tampa in 1982. UP 7006 - ["City of Portland"-1955], retained by UPRR for excursion use. Sold along with 36 other excursion cars 1/19/87 to FNM Mexico. Numbered as FNM 366(2) and painted into FNM's two tone blue scheme and named "Expresso Del Mar" after the train of that name that it was assigned to. Renumberedd 371 after it was discovered that there were TWO 366's on the FNM roster. The car had it's lower level coach seats removed and was re-named during 1989 as "El Yaqui" and assigned to the SCD division. Withdrawn from service and donated during 1994 to the Puebla RR Museum. UP 7007 - ["City of Portland"-1/55], Auto Train 705 (6/72), Delaware Otsego/Cooperstown & Charlotte Valley RR (12/81) - still in faded Auto Train colors - used in excursion service until 1989 then stored Utica NY. Became a CSX asset during 1999. Sold 04/00 to Northern Railcar for possible rebuilding and sale. Sold 07/01 and moved to Illinois Transit Assembly for Don Grant for possible rebuild or resale. Sold 03/02 to Pete Messina/Blake Murphy for rebuild as a lounge. Moved to New Orleans - trucks replaced from ex ATSF hi-level Heartland Flyer rebuild 39944 that burned in New Orleans yards in 2003 - car named "Southern Hospitality" in KCS livery. 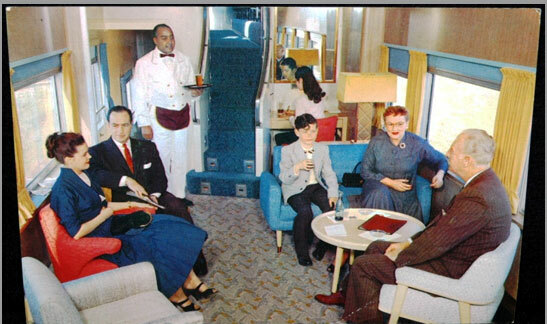 Car rebuilt with a 14 seat lounge at one end, a buffet/bar with 10 seats under the dome, booth seating with tables and 4 swivel parlor chairs from a PRR 1952 parlor car in the dome and 2 bedroom suites at the opposite end. Car will be leased to KCS upon completion. UP 7008 - ["City of Portland"-1/55], Alaska RR 7008 (5/72), (HEP) rebuilt during 1996 as ARR 501. UP 7009 - ["City of Portland"-1/55], Auto Train 706 (5/72), Robert Snow (12/81) "stuffed and mounted" in Orlando FL repainted boxcar brown named "Enterprise" and lettered for "Church Street Station". Car and complex sold during 1988 to Baltimore Gas & Electric and repainted into another coat of boxcar brown without name or numbers. Car and complex again sold during 1999 to Enic Group London England. UP 7011 - ["City of St Louis"-11/58], Auto Train 707 (6/72), Merill Ervin Kanakee IL (12/81), John McGoff/Global Communications (1982) - moved to Williamston MI painted an "off" shade of UP yellow and numbered (incorrectly) 7007, re-sold by his estate through D F Barnhardt on 11/8/91 to Reading Blue Mountain & Northern. Painted dark green as #3 "Catawissa" of "Reading & Northern Railway". Re-sold via D F Barnhardt to Ferrocaril Mexicano as FXE 149015 (9/99) - observed moving KC to El Paso 3/1/2000. UP 7012 - ["City of St Louis"-11/58], Auto Train 708 (6/72), James E Strates Shows (12/81), Kasten Railcar (1984), Hartwell Lowe Corp Yucca Valley CA HLCX 1898 "Marion Mattison", Northern Railcar conversion to dome diner to Scenic Rail Dining 7011 "Mountain View" (800558) (1989), Transcisco/Sierra 49er "Emerald Bay" (10/90), Kalamazoo Lake Shore & Chicago/Wine Country Dinner Train (lease-8/91), UP business fleet "Missouri River Eagle" (5/93) as UPP 7011 (incorrectly numbered - see car number confusion). UP 7013 - ["City of St Louis"-12/58], wrecked 6/66 (repaired and returned to service), Alaska RR 7013 (5/71), sent winter 81-82 to GE Hornell NY to be (HEP) rebuilt as ARR 500. UP 7014 - ["City of St Louis"-12/58], Alaska RR 7014 (5/71), (HEP) rebuilt 1996 as ARR 502, leased (5/98) to Kenai Fjords Tours "Wildlife Express". UP 7015 - ["City of St Louis"-12/58], Apparently shipped to Alaska by MISTAKE! (verified sightings, but no records), Auto Train 709 (6/72), A J Daniels Tulsa OK (12/81), Mid-America Car Co (1982), KCS 22 (for aborted "Southern Belle" revival), Northern Railcar, UPP 7015 (10/90) "Challenger". UP 8000 - ["City of Los Angeles"-4/55], Auto Train 800 (6/72), Roy Thorpe/Falcon Safety Products Mountainside NJ (2/81), Washington Central WCRC 800, then WCRC 106 (1990) "Mt. Rainier" for the "Spirit of Washington Dinner Train" - fluting added under the windowband. Relettered CBRW (Columbia Basin Railway) 11/02. UP 8001 - ["City of Los Angeles"-4/55], Auto Train 801 (6/72) - never used - remained in faded UPRR yellow - reported scrapped at Sanford FL 1982-84, also reports of sale to Antique Enterprises Tampa FL - no trace of such an organization has been found - any info would be greatly appreciated. UP 8002 - ["City of Los Angeles"-4/55], Auto Train 802 (6/72) (not applied) - never used - scrapped at Sanford FL 1982-84. UP 8003 - ["City of Los Angeles"-4/55], donated to National Museum of Transport Green Bay WI (11/71) "Edd H Bailey". UP 8004 - ["City of Los Angeles"-5/55], Auto Train 803 (6/72), Anbel ANBX 2040 (12/81), Northern Railcar (1/88), Scenic Rail Dining "Scenic View" (1987), Trancisco Tours (1989) "Crystal Bay" (800560) / Sierra 49er, Kalamazoo Lake Shore Χcago/Wine Country Dinner Train (lease-10/90), UPP 8004 (5/93) "Colorado Eagle". UP 8005 - ["City of Portland"-5/55], Auto Train 804 (6/72), wrecked in derailment in Georgia. Buyer defaulted at Auto Train auction and was later sold to Passenger Car Associates. Car stripped of all usable parts and sold to D J Joseph Cincinnatti OH - scrapped 1982-83 at Sanford FL. UP 8006 - ["City of Portland"-5/55], Auto Train 805 (6/72) (not applied) - never used - scrapped at Sanford FL 1982-84. UP 8007 - ["City of Portland"-5/55], Auto Train 806 (6/72), 'The Train' Walkersville MD (12/81), Gus Novotny/Maryland Midland #58 EnterTRAINment Line, Mexico tour service Sierra Madre Express "Tucson" (1993). UP 8008 - ["City of Portland"-5/55], Auto Train 807 (6/72), A J Daniels Tulsa OK (12/81), Carland Division of KCS industries (1982) stored at Mid-America Car Co as KCS 19 (for aborted revival of "Southern Belle"), Northern Railcar, UPP 8008 (10/90) "City of Portland". UP 8009 - ["City of Portland"-5/55], Auto Train 808 (6/72), Don Gage Inc Jamestown NY (12/81), Dixie RR Corp of Georgia (1982), Frank Dowd Charlotte NC (8/84), Randy Schlotzhower/Slotsy Tours L.A. CA lettered for Domeliner Tours in UP colors as "Columbia River" (800031) (1986), 1995 painted dark blue/cream colors of "Overland Travel"(mirror of AOE colors) - leased to BKS Partners/Pac River Rail dba Rocky Mountain Daylight lettered as "Pacific Overland" with car name retained, sold outright during winter 1998-99 to Edmond Boyce/RailCruise America St Louis MO - car has been redone at Northern Railcar in the RCA colors of dark green and was sent to St Louis during 8/99. The car was based in St Louis and in excursion / leasing use. Sold 12/05 to Kansas City Southern and renamed "Monterrey" for use on 'Southern Belle' business train.